Take all the required courses for the certificate. You can learn more about these courses at the How To Earn A UX Certificate page. When you have taken the required courses, register for THIS course you are viewing. Once you are in this course you will see a page where you can register to take the UX Certificate Exam. After you register, send an email info@theteamw.com that you are ready for the exam. You will be able to take the exam on the date of your choice. The cost to take the exam is $50 (you receive up to 3 tries to pass the exam). If you purchased a Certificate Bundle the cost of the exam was included in that purchase. We will receive the email request and verify your course completions. We will then email you the specific instructions and URL for the secure UX Certificate online exam site. 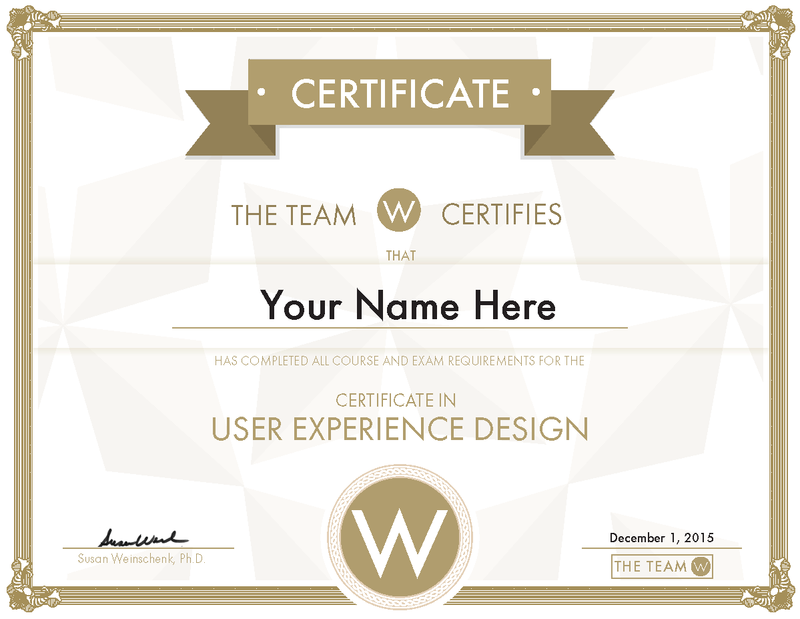 After you take and pass the exam, we will contact you about sending your UX Certificate via PDF (and optional physical certificate if you have a US address).